> Art—GMs>"Make Room For Three More"
"Make Room For Three More" — The Ultimate Chevy Collector's Dream! The mid-1970s was a great time to buy a muscle car. With the shift to more fuel efficient vehicles, dealership back lots were overflowing with unwanted, gas guzzling V-8s. In “Always Room For One” and the sequel, “Found Room For Two More”, the story of this car loving visionary and his growing collection of high performance GM muscle unfolds. 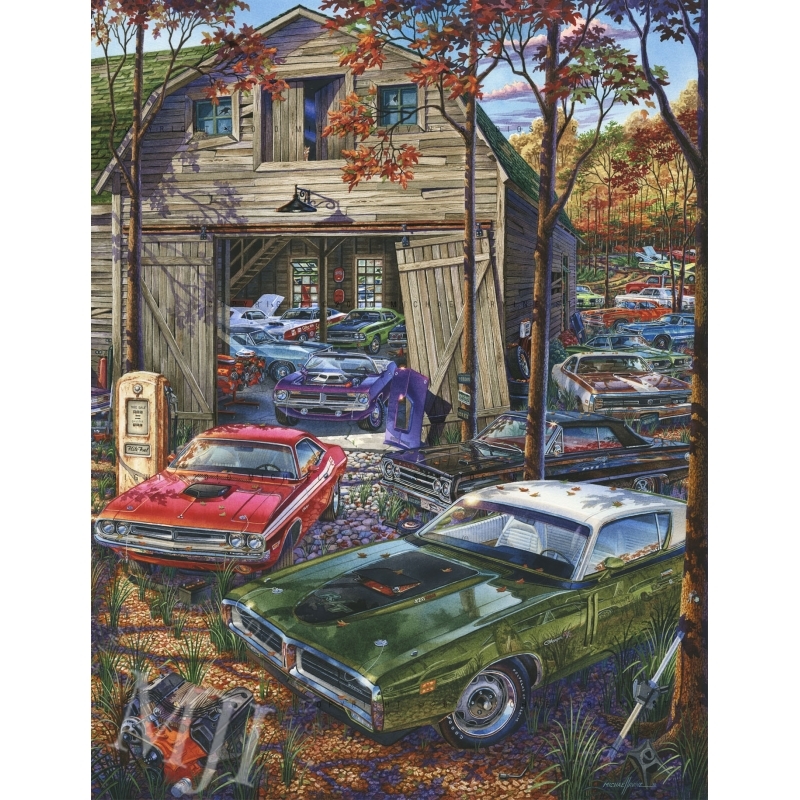 These paintings speak to those enthusiasts who lived the dream, wish they had, or are working on that dream today. In the last painting in this amazing trilogy, “Make Room For Three More,” the final section of this property is revealed, making this the ultimate GM fantasy collection. For the collector, with GM muscle as his interest, an increasing selection at bargain prices tell him one thing: buy all you can! From classic Chevys and Vettes, to GTOs and stylish F-bodies, as well as big block Chevelles, they are all worth saving. And more than just transportation, they are a piece of American history. As the transporter arrives with his newest additions, he knows he’ll have to 'make room for three more'. Also available: "Always Room For One More" and "Found Room For Three More"
Personalized, Hand-Retouched Gallery Edition Artist Proof on Canvas Numbers Matching Set 36" x 48" - Limited to 5. SOLD OUT.